DianaNagorna . Felt in Fashion. Announcement All items in my shop are completely handmade, author's design and many hours of laborious work on each product. Many of garments are unique, One Of A Kind (OOAK). I'm always use only high quality natural materials in my items, namely soft merino wool, silk fibers, silk fabrics , to wrap you in nature's loving embrace. It's absolutely innovative in modern world, made with love, passion and knowledge. I also love the different decors in my items - beads and crystals. Many items are decorated with hand-beaded embroidery, free forms and color combinations, it also makes garments unique and inimitable. I never repeat an item again, I may repeat sold item as similar as possible, but it's never the same item, there are always some differences. I accept custom order. You may send me a message if you have any ideas or wishes, and we will find together a beautiful solution namely for you! where you will find a lot of different news , videos and photos for inspiration, ideas and wishes. All items in my shop are completely handmade, author's design and many hours of laborious work on each product. Diana is a great teacher. This tutorial is excellent. You should definitely know a bit about the basics though...She assumes you know basics like surfaces, tools, etc. Diana has another coming out soon. I’ll be right on it to purchase. Her skill is quite evident and I want to learn from the best and Ukrainian/Russian filters ARE the best! Gorgeous as can be. Creatively innovative and amazingly beautiful. I think your girls should wear these as wrist corsages for all high school and college events - along with weddings! Beautiful work, Diana! Thank you so much ☺️. I want to please my clients in this, perhaps the international day of discounts , and offer two very unusual Felted bags with special discounted price ! Currently my main hobby - is wool. How it all began ... I was, like many artists, in the "creative research." Not in the abstract, but in a very concrete research. I was looking through the stuff that would let me express myself fully. And I found it. First I just got interested, was reading a bunch of literature. Well, "literature" - it certainly said loudly, because nowadays all of the search and study happens on the web. And I began to experiment. Lots of experiments. And I fell in love with this stuff ... for real. Surprisingly, wool, and there are a lot of types of the wool in the world, it’s a unique material. It is flexible and elegant as porcelain, textured as fireclay, with rich colors, like the wing of an exotic butterfly, and heat as the mother's hands, which lulled you when you was a baby. Now I create a full collection of clothes , regularly participate in fashion shows and other fashion events. With great pleasure I work for my clients all over the world . Hello my dear visitors! Thank You for visiting my shop. I enjoy to create all items and I hope you enjoy to admire my work. All my work is inimitable, created exclusively by me. I like to use only high quality natural materials. You can be sure, you will receive quality work. 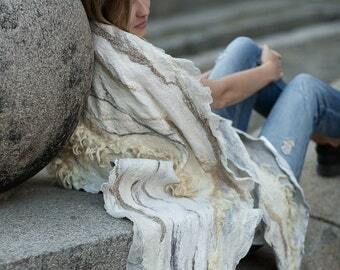 My design is a pure fusion of fibers - a piece of wool, silk and other natural materials. In all my items I use only wool, natural soap and my hands and I work in gentle wet felting technique, that's why they are completely hand made, unique and one of a kind. If you are in any way unhappy with your purchase, please contact me during two business days after receiving the item. You have the right to return it(excluding items made-to-order) by post at your expense, if it in perfect condition. It must be returned unused, in its original packaging. After these two days, return is impossible. I will refund the item via paypal on reception of the item, minus my original shipping cost on this purchase, as well as commissions 1. etsy, 2.paypal , 3.commission of site intermediary, due to the fact that PayPal does not work in Ukraine. (9%) Any refund will be made only after I receive the item back. Please inform me regarding any such matters as soon as possible. I usually wait for payments in 24 hours after your purchase. If you have problems with it, please contact me and we will try to complete your transaction in a best way for us both. I accept Paypal. You can pay by your credit card as well if you don't have Paypal account. (The instructions can be found here http://www.etsy.com/storque/how-to/how-to-pay-with-a-credit-card-and-create-a-paypal-account-746/). If you live in Ukraine you can pay your payments in local currencies to my local bank acconts. Please contact with me and I give you all necessary information. I can ship your purchase anywhere in the world. All items we will attentively pack in our company packeging and send by registered official Airmale with the tracking number. The terms of delivery depends from your location and work of customs. Usually it takes 3 or 4 weeks. The usual period of delivery is 7-10 days to European countries, 10-15 days to the USA, Canada, Japan, 14-21 days to Australia, New Zealand and other countries worldwide. All my items was made in smoke-free studio.